These three photographs show exterior and interior views of Carlin's Drug Store in Salina, Kansas. The first photograph shows an exterior view of the store which is different from the other dated exterior view. The sign above the stairs leading to the office on the upper floor reads, "Dr. Dewees." 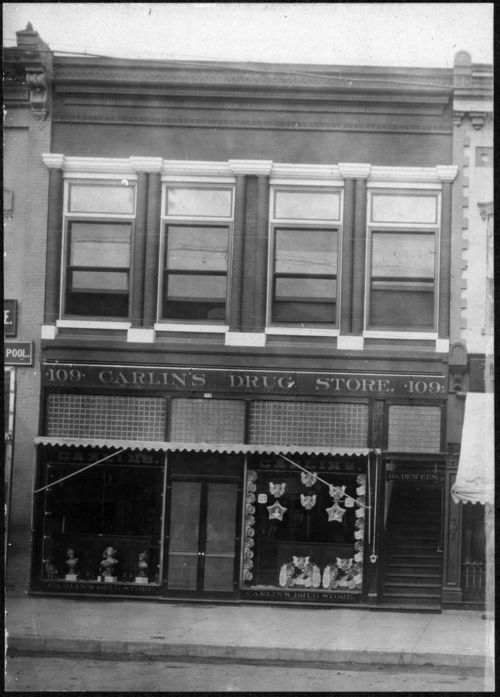 The second photograph shows an exterior view with a sign reading, "Carlin's Pharmacy," and showing the traditional mortar and pestle pharmacy symbol. Three girls and a dog are visible in front of the store. Signs in the windows advertise the comedian Harry Corson Clarke and a presentation titled "His Absent Boy." The third photograph shows an interior view of the store with three men visible. The men are identified (from left to right) as Henry Law, Frank Law, and Tom Carlin. Several display cases are visible along the left and right sides of the store, and the case in the middle contains boxes of cigars. Bottles of chemicals and pharmacy supplies are visible on the shelves along the left side of the store.